Looking for hotels near The National Gallery? Camillas Hus is located in Oslo, in the Frogner district. Offering a bar, the property is located within a 20-minute walk of Aker Brygge. 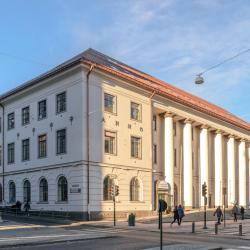 The newly renovated and eco-friendly Thon Hotel Rozenkrantz Oslo is located just 0.6 mi from Aker Brygge and 2297 feet from Oslo Central Station. The elegant Hotel Continental is centrally located in Oslo, only 492 feet from Oslo’s main street, Karl Johan. It is the only 5-star hotel in Norway, and offers free in-room Internet access. This elegant hotel is half a mile from Oslo Central Station and a 2-minute walk from the main street Karl Johans gate. It has free Wi-Fi, along with free gym and sauna access. 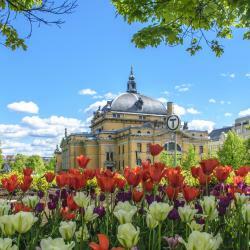 Opened in 1874, Grand Hotel is located in Oslo’s city center, only 1640 feet from the Royal Palace. Karl Johan high street and luxury boutiques are within a few minutes' walk of the hotel. This boutique hotel is 328 feet from Oslo’s main street, Karl Johans Gate, and 5 minutes’ walk from the Gardermoen Airport Express Train departure point. Located in central Oslo, Saga Hotel Oslo Central offers stylish rooms, just 984 feet from Karl Johans gate shopping street. Free WiFi is featured throughout the property. great breakfast......friendly staff.......good location........will stay again. Featuring a bar on the backyard terrace, this trendy central Oslo hotel is just a 2-minute walk from Oslo Central Station. Very comfortable bed, good TV, easy WiFi, varied breakfast and excellent location. Set just 1 minutes' walk from Karl Johans Gate shopping street, this hotel offers self check-in service, free WiFi access and modern rooms with a flat-screen TV. Oslo Central Station is 328 feet away.... Location is very close to center of Oslo. Located in the Østbanehallen wing of Oslo Central Station, this hotel offers free WiFi, a free 24-hour gym and modern rooms with a flat-screen TV. 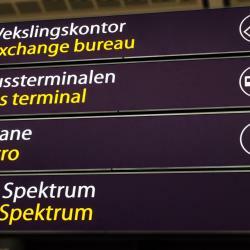 Stay here when we go to Oslo; so convenient and easy! Housed in an early 1900s building in Oslo, Cochs Pensjonat offers free Wi-Fi and rooms with private bathrooms and kitchenettes. 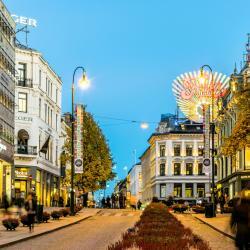 Karl Johans Gate shopping street is a 10-minute walk away. Perfect Location. Clean and well maintained. Friendly staff. 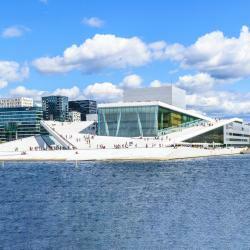 Located 1148 feet from Oslo Central Station, this hotel features a lobby bar and free WiFi. Guests can choose from studio and guest rooms. I liked the small hotel, breakfast was astounding, location perfect. 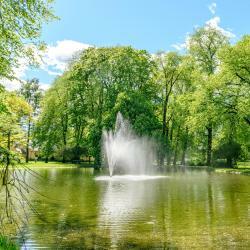 Centrally, yet quietly set just a 1-minute walk from the main shopping street Karl Johans Gate, this hotel is 0.6 mi from Oslo Central Station. The staff was really kind. All the hotel (bedroom and breakfast room) was clean and pleasant. Located right next to the Aker Brygge shopping and entertainment area in Oslo, Thon Hotel Vika Atrium offers free Wi-Fi and rooms with flat-screen cable TVs. The Nobel Peace Center is 1476 feet away. Excellent breakfast. Centrally located. Scandic Byporten is located in the heart of Oslo, just a 1-minute walk from Karl Johans Gate shopping street and Oslo Spectrum arena. 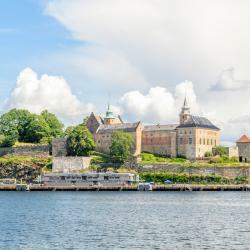 It offers rooms with Scandinavian-style décor and free WiFi. very comfortable hotel at a great location next to the Central Rail Station. Hotels with great access to The National Gallery! Camillas Hus is located in Oslo, in the Frogner district. 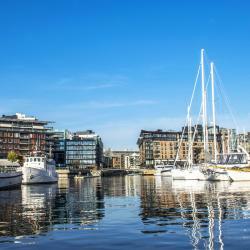 Offering a bar, the property is located within a 20-minute walk of Aker Brygge. A quiet, attractive and convenient location, a beautiful room, friendly staff, perfect breakfast. 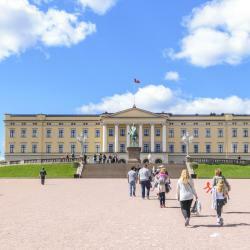 Opened in 1874, Grand Hotel is located in Oslo’s city center, only 1640 feet from the Royal Palace. Karl Johan high street and luxury boutiques are within a few minutes' walk of the hotel. Everything was amazing, and the bed was so comfortable! This boutique hotel is 328 feet from Oslo’s main street, Karl Johans Gate, and 5 minutes’ walk from the Gardermoen Airport Express Train departure point. Nice hotel, friendly staff, walking distance to many attractions, clean room and bathroom. Located a 2-minute walk from Oslo Central Station, Thon Hotel Terminus offers free WiFi and rooms with flat-screen TVs and free Nespresso in reception. The Rockefeller Music Hall is 1148 feet away. our hotel room was amazing...so big! Thon Hotel Slottsparken is located next to the Royal Palace in Oslo, a 5-minute walk from Karl Johans Gate shopping street. It offers free WiFi, an on-site fitness center and rooms with a kitchenette.... The hotel staff were very pleasant and very helpful. Thon Hotel Panorama is located in the heart of Oslo, only 5 minutes’ walk from Karl Johan shopping street. The hotel has a 24-hour reception and rooms with free Wi-Fi. All hotel staffs are so nice. Breakfast and coffee are very good. Amazing collection of paintings (not so many sculptures, though). If you are like me and doesn't know much about Norwegian painters, this is a great place to start. They have a little of everything, which makes it very interesting and visitor-friendly. 2-3 hours is enough to get a good look. People are talking about The National Gallery! Explore guest hotel reviews featuring "The National Gallery"
Location is really excellent right next to the National Gallery. Really nice to have a little meal in the evening included in the room price. Loved the breakfast! Get tickets for a perfomance at the Opera House; go to the National Gallery and the Modern Art Museum on a Sunday for free; do a city walk that follows in the footsteps of Munch and Ibsen.